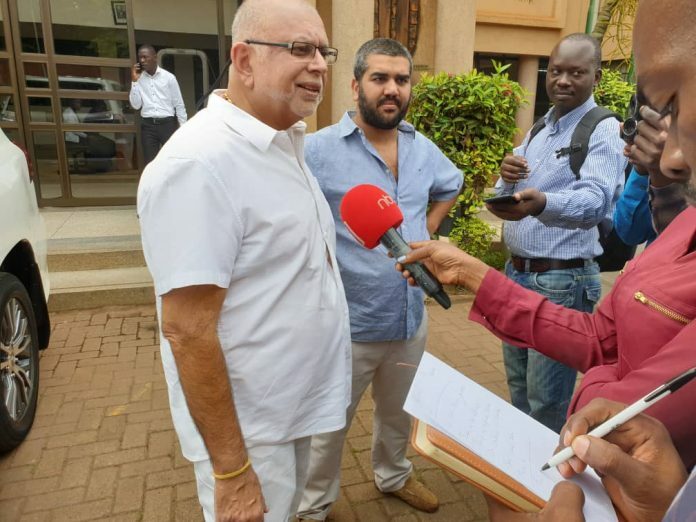 KAMPALA – Justice Paul Gadenya Wolimbwa has set April 24, 2019, to deliver his ruling in which city tycoon Sudhir Ruparelia wants the new lawyers hired by Bank of Uganda declared conflicted, and therefore unfit to represent the central bank in the commercial dispute with the businessman. Through his real estate company, Crane Management Services, Mr. Ruparelia sued dfcu Bank demanding rental arrears amounting to UGX2.9b and $385,728.54 in respect of tenancies of suit properties that were formally owned by Crane Bank. However, in defence, dfcu contracted the law firm of Sebalu, Lule and Advocates but Mr. Ruparelia says he contracted the same law firm in 2006 to draw and review tenancy agreements in respect of the said rental premises thus there is conflict between the lawyer and his client. “In view of the advocate-client relationship between the applicant (Crane Management Services Ltd) and the 1st respondent (Sebalu & Lule advocates), the latter’s continued participation as defence counsel for the 2nd respondent (Dfcu bank) herein, which is the defendant in High Court Civil Suit (HCCS) No. 109/2018 against the applicant/plaintiff, is prejudicial to the applicant’s head suit,” the petition reads, in part. He further says that during their client-advocate interaction with the firm, he revealed privileged and confidential information which dfcu can exploit to his disadvantage in the present dispute before court. In responses to his worries, the firm Sebalu Lule which is represented by Mr. Peter Walubiri asked the judge to dismiss the application for lack of merit saying the tenancy agreements drawn in 2006 are not confidential in any way to dent Mr. Ruparelia’s case. Mr. Rupareria also wants the court to issue a permanent injunction, restraining Sebalu & Lule Advocates from appearing as defence counsel for dfcu Bank in the other court case that the two principals are battling out. In December 2017, the Commercial court disqualified Mr. Masembe and Mr. Mpanga from the UGX397b Sudhir Ruparelia’s case against Bank of Uganda (BoU), citing conflict of interest. In his ruling delivered on December 21, 2017, the head of the commercial court division, Justice Wangutusi stated that Mr. David Mpanga of A.F. Mpanga Advocates and Mr. Timothy Masembe of MMAKS Advocates acted in violation of the Advocates (Professional Conduct) regulations. Section 4 of the regulation provides that an advocate shall not accept instructions from any person in respect of a contentious or non-contentious matter if the matter involves a former client and the advocate as a result of acting for the former client is aware of any facts which may be prejudicial to the client in that matter. Some of the properties cited include; Crane Bank branches at Plot 9 on Market Street, Plot 1-13, Jinja Road, Plot 47, Republic Road – Mbale, Speke Hotel (1996), Plot 19 Cooper Road (Crane Plaza), Plot 20, Kampala Road – Crane Bank ATM.